We are all aware of how the dupe data mining companies use fake branding material of big companies and fool people into signing up or giving away their information. One such recent scam has been reported by Morrisons. 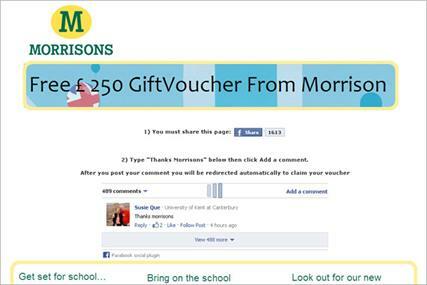 Apparently it is targeted at Facebook users into clicking a link to get a free £250 gift voucher. The link features all Morrisons branding in an attempt to cheat Facebook users. In fact if you tried to leave the page, you will be notified saying you are “today’s winner”, luring you to stay back to claim the prize. Morrison has already posted a warning on their website notifying that this is a scam. Internet has become so open that a scam like this is not surprising. For people who already became a victim, just filter those emails and mark them as spam. After two years f work with GM, their global marketing chief, Joel Ewanick has resigned effective immediately. The question exists whether he was asked to resign or he did it voluntarily. Although GM spokesman Greg Martin said in a statement that Ewanick failed to meet the expectations. Prior to working with GM, he was VP of marketing for Nissan where he just worked for a month. Before Nissan, he worked with Hyundai Motors as VP marketing. There he pioneered the Hyundai Assurance Program in 2009 under which customers could return their cars if they lost their jobs. This program was canceled in 2011. Most surprising under his leadership he pulled advertising from Facebook and did not promote advertising on Super Bowl as well. Maybe that’s what pointed to lack of his performance. Lets see what happens to GM now!